Ah, Door County. To say that I love our annual trip to Door County is an understatement. It is one of the few places in the state where I don’t have to use my allergy medicine. Although, I did bring back a very bad cold this year. Unlike previous years, we didn’t go up after Labor Day and stay an entire week. We went up on Saturday and came back on Labor Day. Also, unlike most reviews, I’m not going to pick one spot and review it, I’m going to mention the various places we visited and give you my opinion on them. On Saturday, we picked up our grandsons – Danny and Alex – up in Green Bay and drove up to Door County. We checked in at the Comfort Hotel in Sturgeon Bay. Frankly, I think $125.00 a night is a bit pricey. However; the staff there are very nice, which makes up for the high price. I’m known to be on the cheap side and knowing that I have had the same room (or a similar one) for forty dollars less just bugs me to no end. On the other hand, the $125.00 price tag is right in line with all other area hotels. The Comfort Inn is pet and kid friendly, has a small swimming pool, free wireless Internet and a nicely done Continental breakfast that includes Waffles. The boys love waffles. When we checked into the Comfort Inn, Danny was still sleeping in the backseat of the car. Cute, isn’t he? Alex accompanied me into the lobby, where Bobby checked us in and set the ground rule that no one can go swimming unless they have eaten lunch first. I thought that was a nice touch and really helped me convince Alex that we have to eat first. Kim had packed the boys clothes in their school backpacks, which made unloading the car very easy. Each boy was thrilled to carry his own luggage into the hotel. Alex even took his backpack down to the lobby to show Bobby. Once the car was unloaded, it was time for lunch. We headed down to downtown Sturgeon Bay. We gave the boys the choice of eating in the Inn at Cedar Crossing or across the street at the Pudgy Seagull. The Seagull won hands down. What boy doesn’t want to eat at a place called the Pudgy Seagull? The Seagull is very family friendly and not very expensive. Lunch for the four of us came to just over twenty dollars. Not a bad price to pay in a tourist town. Cheryl and I had the egg salad on wheat toast (you get your choice of bread), Danny had a cheeseburger and Alex had a chocolate chip pancake with a side order of cole slaw. What can I say, the kid has a cast iron stomach. The egg salad was nicely done, it wasn’t salty and it had an almost sweet taste to it. Also, it wasn’t so crammed onto the bread that it dropped everywhere and it wasn’t so mayonnaise layered I was wondering where the eggs were. Next was a stop at Paul David’s Jewelry store in Fish Creek. We purchased a very beautiful diamond ring from Paul around five years ago and every year Cheryl and I stop to have him inspect the ring and clean it. Taking good care of your jewelry is very important. Unfortunately, while we were there, we received bad news. When my grandmother died, my only inheritance was her wedding band and engagement ring. I had taken them to a different jewelry store and had them inspected, had them separated, had new shanks put on and had all the diamonds re-tipped. Since then, I have lost two of the small diamonds, one in the wedding band and one in the engagement ring. Turns out, according to Paul, they didn’t re-tip my rings properly. They charged an outrageous sum of money and only placed one tip on each diamond. So, Paul now has my grandmother’s wedding band and he’s going to properly tip the rings. I’m just kicking myself for not taking those rings to him in the first place! The boys were restless – they wanted to go swimming – so we didn’t stop to look at any of the other shops in Fish Creek. However; the boys did allow us one stop on the way back to the hotel: Wood Orchard Market. This is a great little shop with fresh fudge, homemade pies (cherry and apple) and a slew of other items. We picked up a cherry pie, cherry salsa, cherry cider and two six packs: one of (yes, you guessed it) cherry soda and one of root beer. We would’ve picked up more, but the boys were restless. Wood Orchard Market sells an apple called SweeTango. Oh, it is the perfect combination of tangy and sweet. I wish we had picked up a bunch of them. We meant to stop again, but we forgot. Next year, I’m bringing home a basket full! One of the nice amenities to Wood Orchard is the fact that they have both a slide and a little race track – complete with pedal cars. 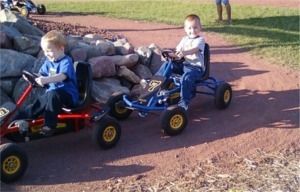 The boys loved the pedal cars. This is a terrific way to keep rambunctious kids happy, while the other parent (or in our case, grandparent) shops. The rest of the evening was spent in the hotel and, of course, in the hotel swimming pool. Both boys aren’t afraid of the water. They love to stand on the side of the pool and jump into our arms. Alex, who was scared of the water last year, kept wanting to be dunked and I was more than happy to oblige. This was just one day in Door County and, as much as I’d like to tell you about day two and three, I think I’ll combine them into my next article.